Lost Dog Street Band was created in the winter of 2010 after a long and bitterly cold trek on foot to Tennessee. 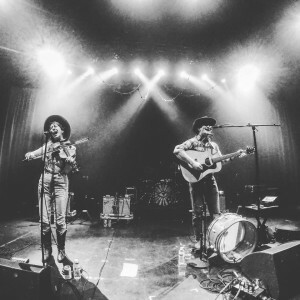 Splitting paths from their former project Barefoot Surrender, Benjamin Tod and Ashley Mae set out to craft their own original music as a duet. Drawing on inspiration of hard times on the road, personal tragedy, the power of love (and of course their dog) Benjamin continued on with a long legacy of songwriting that cuts to the quick. Knitting together musical influences from traditional country, old time, and blues Ashley Mae and Benjamin began to refine what is their original take on American storytelling songs. With their packs, fiddle, guitar, banjo, and pup they set out on foot traveling coast to coast by hopping freight, and hitchhiking with the vision of sharing their music. Along the way, they met many inspirational musicians. Amongst them was Nicholas and Shannon Ridout with whom they formed the project Spit Shine in the year 2012. After the tragic loss of their dear friend Nicholas, Lost Dog Street Band hit the road in search of solice and a deep seated need to continue sharing music as a source of comfort. Today, Benjamin and Ashley have made a home in the country side of Tennessee, working the land and carrying on their lives as full-time musicians. As they tour regularly, perhaps you will see them roaming across the country in their van with their dog Copper. Mama’s Broke: Lisa and Amy came together on the road, which keeps on defining their music. They continue to travel the world, by all means, playing anywhere from warehouses in New Orleans to pirate ships in Amsterdam. Two strong voices blend to create haunting harmonies, while they artfully juggle an array of instruments including fiddle, banjo, guitar and mandolin while incorporating traditional dance and foot percussion. Original songwriting combined with folk styles ranging from old-time to Balkan to Celtic , create a compelling performance delivered with heart and raw energy .